Tropical beaches, explosions and a handsome hero - Just Cause has everything an action movie could want. 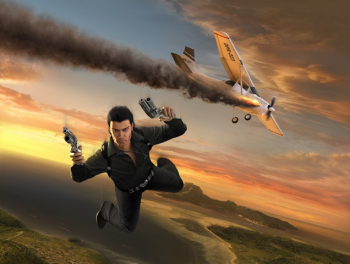 Avalanche Studio's 2006 sandbox action game Just Cause is to make its way to the silver screen via Eric Eisner's L+E Productions. Eisner will develop the property with Hitman and Kane & Lynch producer Adrien Askarieh before taking it to studios. Just Cause tells the story of CIA agent Rico Rodriguez, who heads to the fictional Caribbean island of San Esperito in order to help overthrow a military dictatorship thought to be in possession of weapons of mass destruction. The game is stuffed full of guns, cars and explosions, not to mention grappling hooks and base jumping, and it seems like it would be a really good fit for a summer action blockbuster. Moreover, the game's story is short enough that it can be cut down into a two-hour movie without losing very much. But despite the good fit, it's unlikely to be plain sailing for the Just Cause movie. Eisner's production company has released just a single film, a Steve Coogan comedy called Hamlet 2 which made only half of what the rights were sold for at the Sundance Festival in 2008. On top of that, the attached screenwriter Michael Ross has only had one other script made into a movie, the horror movie Turistas, which didn't exactly set the box office on fire either. Neither of these facts necessarily means that Just Cause will be bad, but they don't exactly inspire confidence, and could make it harder to attract investors and get the movie made.